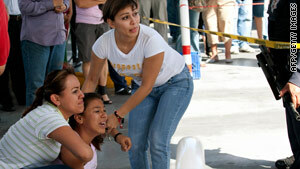 Relatives of murder victims grieve in Ciudad Juarez. (CNN) -- For Bob Cook, creating jobs in Ciudad Juarez, Mexico, is one of the few ways to put an end to the violence. An American businessman, Cook sells the murder-plagued city as the place for global businesses to set up shop. In an area where residents routinely see streets covered in blood, Cook sees green from potential deals, but it's a tough sell. Cook, 50, has operated intermittently in El Paso, Texas, just across the border from Ciudad Juarez since 1985. He loves the town and embraces its sister city to the south. When Cook refers to Ciudad Juarez, it's disarming to hear him -- a fair-complexioned fellow with red hair -- pronounce the city's name with a fluent Spanish accent. The Texan cares about Juarez. He's dedicating his professional life to persuading big businesses, some of them American, to move to Juarez or at least open facilities there. His private, non-profit company, REDCo, (for El Paso Regional Economic Development Corporation), opened in June 2004 to help draw business to the region shared by the cross-border cities. "I think it's rational for someone to look at the headlines and be fearful of investing anywhere in Mexico right now," Cook said in a phone interview. "But it's not my job to convince them to overcome their fears. My job is to show that you can operate [in Juarez] without incident...or without serious incident." While the chaos and violence of a war between drug cartels engulfs the city, Cook said the manufacturing industry in Juarez, which produces an array of products including automotive parts, medical supplies and electrical products such as light switches, goes largely unaffected. As the focal point for Mexican President Felipe Calderon's war on organized crime, Ciudad Juarez has had the misfortune of redefining urban violence. In 2009, more than 2,600 people were killed. This year, some local reports have it as high as 810, just through the first four months of the year. But in the last two years, there was only one reported homicide in Juarez's desgination industrial areas, according to statistics released by the Chihuahua State Police. Out of security concerns, Cook won't confirm or deny exactly who his clients are. Being safe is part of what's helped Cook succeed in Juarez; it's part of the pitch he gives to potential companies wanting to do business. According to statistics kept by Desarollo Economico de Ciudad Juarez, a leading non-profit organization that keeps track of companies in the city of 1.4 million, more than 200 American companies were operating in Juarez in 2009. Among the companies were Honeywell, Avery, Cadwell and Johnson & Johnson. Cook said more are talking about coming. "There are competing realities that are difficult to explain," Cook said. "You have to be here to see it. In all the times I've been there, I've never felt unsafe...never seen a dead body...I've never heard an explosion. "I was just [in Juarez] last week. I'm more alert. I'm looking for those things that look out of place. I travel on well-lit roads. There's no question the environment is different for service companies, but I don't work in that sector." While municipal police say small business in Juarez is collapsing in large part because of the drug-fueled violence, big business goes on. Industrial sites patrolled regularly by state police thrive financially, at the same time owners of local shops and other businesses in downtown Juarez say they pay hundreds of dollars a month in extortion fees to criminals. From 2008 through February 2010,10,670 businesses in Juarez shut down, according to the Mexican Chamber of Commerce. That's a part of Juarez that Cook acknowledged exists, but talks little about. He'd rather focus on the pluses, like the large, readily available and competitively priced labor force in Juarez. That labor force continues to be a factor in why companies from as far away as Germany and Japan chose to do business in Juarez, Cook said. "It has a good central location, as well," Cook said. "Just two years ago, Foreign Direct Investment Magazine ranked Juarez 'the city of the future' because of its infrastructure and because of the cost of doing business." Other than Mexico City, Juarez records the highest level of industrial space in the country, according to Cook. He said about 360 manufacturing companies employ 200,000 people in the area. That number is growing. In the first quarter of 2010, Cook said his company REDCo helped create 19,000 more jobs. Imports to Texas, Cook said, were up 15 percent from the previous year. "Thirty-four percent of what our maquiladoras manufacture are related to auto parts," said Manuel Ochoa, Cook's vice president of Bi-National development at REDCo. Maquiladoras refers to assembly plants that have sprung up along the Mexican side of the border in the years since the North American Free Trade Agreement was passed in 1994. The factories on Mexican soil can bring in materials and equipment under low tariffs, use cheaper labor in the manufacturing process and then export finished goods to the U.S.
"Bosch has a huge presence here. Of the top 10 car-part manufactures worldwide, we have seven or eight of them located here," Ochoa says. Ochoa, 52, has worked with Cook for the last 10 years. He is one of the roughly 4,000 people that live in El Paso who cross the International Bridge daily to work in Juarez. He's been doing it for the last 16 years. "Juarez is in the middle of a battle -- you see it with the (drug) cartels, which are battling for the territory, and you see it with manufacturing companies who want to come here," Ochoa said. "Especially in the last 24 to 28 months, with the economic crisis internationally, there's lots of activity among companies to look for other options to be more competitive." Juarez is the answer, Ochoa said. "We understand the negative publicity regarding the violence in Juarez," Ochoa said in English through a heavy Spanish accent. "El Paso is the second safest city for one over 500,000 people. On the other side is the most dangerous city, Juarez. How do they cohabitate? "I know it's hard for people to realize not all of Juarez is contaminated either. Inside industrial parks it's a secure area. That doesn't mean there's no crime in that way. It's just not a major problem," he said. Cook is less bold than his partner about trumpeting achievements of safety. He pauses before he opens up about how the reputation of Juarez has changed. "The cartels have created an unstable environment for them to do their dirty deeds. It's caused great emotional strain. No question that the lives of the people who live there have been disrupted," he says, adding, "And there have been horrific mistakes in violence that's been perpetrated against innocent people." He cites the two most high-profile attacks against innocent civilians: the January killing of 15 people at a house party, most of whom were innocent students with no ties to organized crime; and the March killing of three people with ties to the U.S. consulate, who were on their way back from a children's birthday party. The female victim in that shooting was pregnant. "The violence does cause emotional strain," Cook says. "We've had two companies, which I can't name, that have come to us and said their headquarters have asked them to reassess, etc. And, in the end, they decided to stay [in Juarez]." The symbiotic relationship between El Paso and Juarez goes back a lot further than Cook can remember. In his own personal history in the two towns, Cook doesn't want to be remembered just as someone who was brave enough to do his job. He strives for a place as someone who believes strongly in what he does and believes he knows how to help Juarez get back on its feet. "I can see the pain and the strain. Juarez needs a lot of folks to recover. They need the Mexican government focusing on infrastructure to areas that need it. They need schools and parks," Cook said. "They need the citizens of El Paso and the government of El Paso to be loud and vocal. Mexico is a sovereign nation and the government has to identify those things that they want from the U.S. in order for this to work. "I know, at some point, El Paso is going to need Juarez to step up, and I think it's our time to do that,'" Cook said. It's a hard sell for Cook, but he does it because he loves Juarez. Plus, he does it because, right now, no one else will.